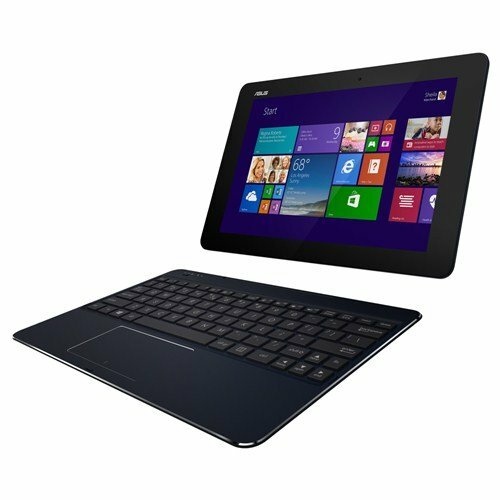 As 2-in-1s go there are few to beat the Asus T100 Chi by price point. It's a solid device with only a handful of downfalls that cost it from perfection. But given that it's about as well made as a Microsoft Surface, it'll make the ideal work and play partner for those on the go - especially at this price point. It's all Zen and Chi over at Asus HQ of late. The company's latest laptop-meets-tablet, the Transformer Book T100 Chi, has meditated its way to a slimmer, fitter state than its more letter-laden T100TAF predecessor, presenting a slender design that incorporates a bump in specs too. In its newfound form, the T100 Chi boosts its metabolism with a respectable Intel Atom Bay Trail processor (no Cherry Trail here for those hungry for it) and squeezes a high-definition (1920 x 1200 pixel) resolution into its 10.1-inch display. No scrimping on the specification here, not at this price point. However, at £399 it is £50 more than its predecessor was at launch, nudging it away from the most budget levels. But with full Windows 8.1 on board, a digital stylus included in the box and a respectable overall feature set, is this the 2-in-1 device to own? We've been living with the T100 Chi for a long weekend to get a taste of what it's all about. Most devices under £400 are ultra-plasticky, whereas the T100 Chi throws in metal chamfered edges and reassuring rigidity that blows plenty of Chromebook competitors out of the water. It's not a million miles behind Microsoft Surface by design, but at a cut of the price and, of course, with the keyboard dock and stylus included. That's the thing about the Transformer Book T100 Chi: it's designed for multiple uses straight out of the box. We've been predominantly relying on it as a portable laptop device, but the 10.1-inch screen comes away from the keyboard dock with a firm pull - no button pressing required, thanks to a strong magnetic connection - to make for a usable tablet device. The use of micro-USB helps keep the scale down, with the tablet's 7.2mm thickness - nay, thinness - being slimmer than some current smartphones. Add the keyboard dock's 14.8mm addition and the total 22mm is still slender for a full laptop. Weight-wise it's just over a kilo all in. The "micro" theme doesn't stop there either: with a micro-USB 3.0 port, microSD card slot, and micro HDMI port to the side, the T100 Chi takes micro to the max. We're happy with these kinds of ports, but the lack of a full size USB port (not that it'd fit in at this scale) will have some impact on plenty of users. Buying a micro-to-micro cable for that external hard drive, for example, is something to keep in mind. USB sticks or a camera's SD card? Forget about it. In some respects the Chi represents Asus looking forward, almost how Apple has with its single-port 12-inch MacBook, but that's not going to suit all - sometimes it's best to jog before running. While the chunky bezel surround of the T100 Chi's LED-backlit display isn't as forward-thinking as some dedicated tablet devices, as a display the T100 Chi has plenty going for it in either tablet or laptop form. Primarily it's the resolution that's the winner, marking a notable improvement over the previous T100 model. With VLC Player installed we've been watching some Full HD 1080p video, neatly fitted across the device's 1920 x 1200 pixel panel. The viewing angles, too, allow for much steeper angles of view than almost any Chromebook we've ever used, which avoids those head-bobbing moments when trying to view details throughout every part of the screen's surface. On the downside the coating is somewhat reflective, which has meant catching a few too many glimpses of our gawping face on the screen. Countering this with an injection of brightness - which can be manually controlled - goes some way to negating it, but that will cost battery life overall, so keep a balanced approach in mind. The two-part design of the T100 Chi has its quirks, with a confused battery and charging situation being a notable downside. Both tablet and keyboard dock have their own micro-USB 2.0 ports, as used for charging when necessary. However, there's no power transmission between the two parts, so a single charger plugged into the dock doesn't charge the attached tablet portion in tandem. The charging port for the keyboard dock is only there so there's enough juice for its Bluetooth connectivity, but it can't be used to bolster the battery life of the tablet. Why there's no power transmission between the two parts, we don't know - it's the Chi's biggest design flaw. We've had the keyboard dock run out of battery power independently of the tablet, transforming it into temporary dead weight and meaning the touchscreen keyboard has had to suffice. Individual on/off switches/buttons on both devices is simply archaic; the physical pairing of the two ought to be enough to instigate the keyboard's use in today's intelligent, tech-rich world. However, the tablet's 30Wh battery (which, by our calculations based on 5V consumption is a 6,000mAh capacity - about the same as a phablet) lasts well enough with the 32-bit version of Windows 8. In our case, on a working day, we got around 8-hours of use. Asus claims 10-hours, which we suspect is plausible without Bluetooth dock connectivity, application usage kept to a minimum, and the screen brightness dimmed and - but we like a punch of brightness to keep our eyes alert. However, we have also noticed on the more casual use days writing up this review that the battery seems to deplete a little quickly when the device is in sleep mode - a dip from 63 to 36 per cent in around three hours after a restart, with the lid closed, for example. So while there's a downright odd charging format, the T100 Chi will last for a reasonable length of time in a single sitting. Competitors like Dell and its Venue series will likely outshine this Asus in terms of longevity per charge, if you're willing to accept the extra weight and size. Using the T100 Chi works well as a Windows 8 tablet. We've found the touchscreen response to be snappy and accurate, although at this resolution some links and icons may be so small that you'll want to upsize them. The Intel Atom Z3775 processor at its core, clocked at 1.46Ghz is paired with 2GB RAM and will chug through the usual tasks. Browsing with multiple tabs, word processing - Office 365 is included, but the prompt suggests this is an offer until 15 October 2015 only - Skype calls, video playback and so on. However, don't expect to play power-hungry games or video editing to come as standard, it's just not powerful enough, but full-scale applications like Photoshop Express will run just fine - that's the beauty of full Windows, it's not as limited as Chrome OS, for example. Eating into the 64GB eMMC on-board storage is the Windows install, along with some applications such as McAfee LiveSafe virus protection. From first startup there's 42GB available of a 48GB maximum remaining. Of course the microSD card slot to the side can be used to enhance this storage capacity at an affordable rate. One issue we found was fussy Wi-Fi connectivity, initially failing to verify our correct password. A hard-press of the WPS button on our router enforced the connection - but this was forgotten within a day for some reason. Connectivity since has remained strong and the 802.11 a/g/n connection, despite not being the fastest 802.11 a/c, has held up fine for our needs. As a 10.1-inch device, the T100 Chi isn't especially large, and as the keyboard and trackpad area has to exist within a 174 x 265mm area it may feel a bit squashed at first. We got used to it, but these aren't full-size keys and their spacing is rather close together. The whole keyboard dock is also entirely rigid, which gives an assured typing experience. The trackpad is also small, but adjust settings for the cursor to move swiftly enough around the screen and it provides ample space. With the original T100TAF we found the trackpad was ill responsive, but that's not the case with the T100 Chi. The one small typing bug we've found is an occasional lag between hitting a key and the corresponding letter appearing on screen. It's usually an initial issue, with proceeding taps of keys flowing onto screen at pace - but as this is Bluetooth paired, not hard-wired, that could explain why. Compared to the original T100TAF the T100 Chi is a considerable step forward, well worthy of its price bump. The increase in display resolution, processor speed, and inclusion of a digital stylus are all obvious plus points. But it's not quite perfect. The batteries in both tablet and keyboard dock are independent, which can be a bit confusing for laptop use if the keyboard's juice supply depletes before the screen does; the micro ports will catch out some who are used to full-size USB; while the keyboard dock's small-scale keys and trackpad take some getting used to. Overall, in context to the market, the T100 Chi has all the hallmarks of a firm favourite. It's affordable as to not break the bank, about as well made as a Microsoft Surface, and will make the ideal work and play partner for those on the go. Like its Chi name suggests, it's a healthy balance of positive and negative.